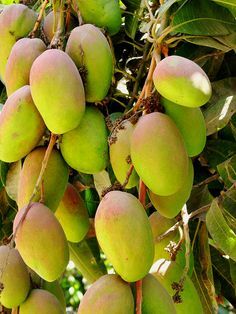 I am a die hard Mango lover..!Its in June-July that it is the Mango Season in many countries of around the world…My favourite time!And when mangoes are not in season,I go for canned mangoes!So you can imagine how much I do love mangoes!I like Mangoes in any form…Its simply delicious…!Dont you agree? And I remember my grandmother…she used to always have a glass of some drink always ready for me when I would be back from school..And during the Mango season..it was Mango smoothie time after school…I used to so so love it a lot…So here today I made this very nostalgic Mango Smoothie…very easy to make and extremely delicious!! Add all the ingredients above mentioned in a blender and blend till smooth. Transfer to serving glasses and Enjoy!! This entry was posted in Uncategorized and tagged Cardamom, Elakka, mango, Mango drinks, mango juice, mango smoothie, Mango smoothie without icecream, summer drinks. Today I am here with an Eggless Chocolate Mousse as dessert!Mousses have always attracted me…for one thing..their awesome taste and the other..their creamy yet light texture.I never miss out the chance to grab this whenever we go to the cake shops here.The people here are crazy about mousses..due to which they are many varieties of them available on the bakery shelves.My favourite out of them all is the Chocolate Mousse!Nothing beats the taste of this. Unlike the many mousse recipes,I have’nt used cooking chocolate here..instead I have used cocoa powder.So THIS IS A NO CHOCOLATE RECIPE! !And it really tastes great and it has a very light,fluffy and creamy texture.And it is extremely easy to prepare.My family just loved it when I served them this for dessert after dinner today. 1. Sprinkle agar agar powder over cold water in a small bowl,gently mix and let stand for 1 minute. Add boiling water, stir until agar agar powder is completely dissolved. Cool slightly. 2. Stir together sugar and cocoa in a medium bowl; add whipping cream and vanilla essence to the bowl. Beat on medium speed of electric mixer, scraping bottom of bowl occasionally, until mixture is stiff. Pour in agar agar mixture; beat until well blended. (DO NOT OVERBEAT) Spoon into serving dishes. 3. Refrigerate about 30 minutes before serving. Garnish as desired.Serve and Enjoy!! 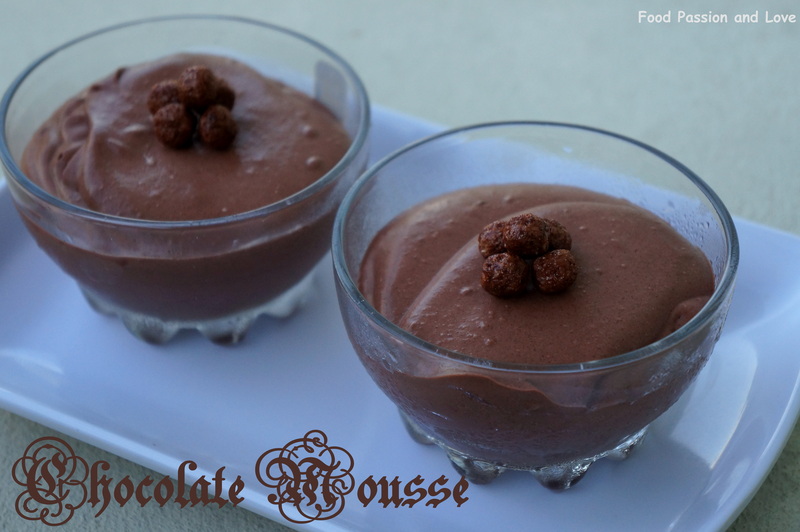 This entry was posted in Uncategorized and tagged agar agar.eggless, Chocolate mousse, chocolate mousse using cocoapowder, cocoa powder, Mousse, No chocolate chocolate Mousse, No cooking chocolate. 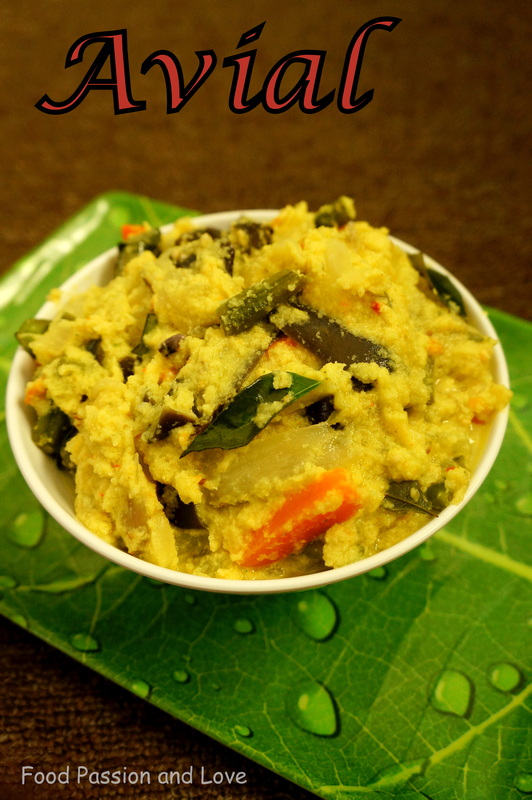 Avial is a staple dish during Kerala Sadyas…A sadya without avial isnt a sadya! Avial is a very simple dish,extremely easy to make.When I made Avial for the first time I remember..I was surprised.I expected Avial to be a complex and a difficult to make kind of dish.But when I made it..it was soo simple even when I was a beginner in the world of cooking 🙂 Avial is a really nutritious dish…you can make it with any kind of vegetable..no hard and fast rules regarding this..And I greatly suggest that you use coconut oil..It brings out the flavours to a great extent! 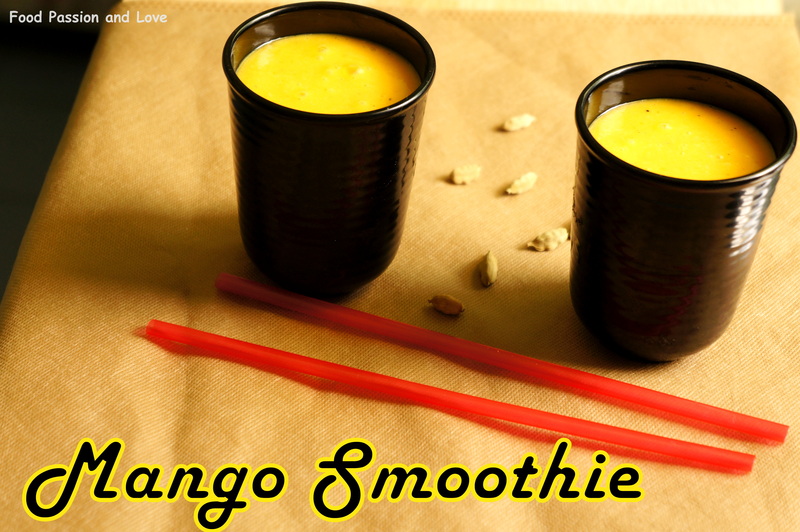 !…and with addition of yoghurt ,it provides the exact tangy taste so that you can relish it with Rice. Vegetables – (drumstick,carrot,beans,elephant yam,cucumber, Potato,snake gourd) – 2 – 3 cups( you can use any vegetables of your choice). Chop all the vegetables in medium length and cook it with just enough water and salt. In a food processor coarsely grind grated coconut , cumin seeds , turmeric powder , garlic , green chilies and curry leaves. Add this and yoghurt to the cooked vegetables and combine well. Simmer for a minute and remove from fire. Drizzle a table spoon of coconut oil and some curry leaves and serve warm with Rice and Enjoy! This entry was posted in Uncategorized and tagged Avial, Aviyal, Banana leaves, easy avial, Kerala, Onam sadya recipes, Vazhayila, Vishu sadya. 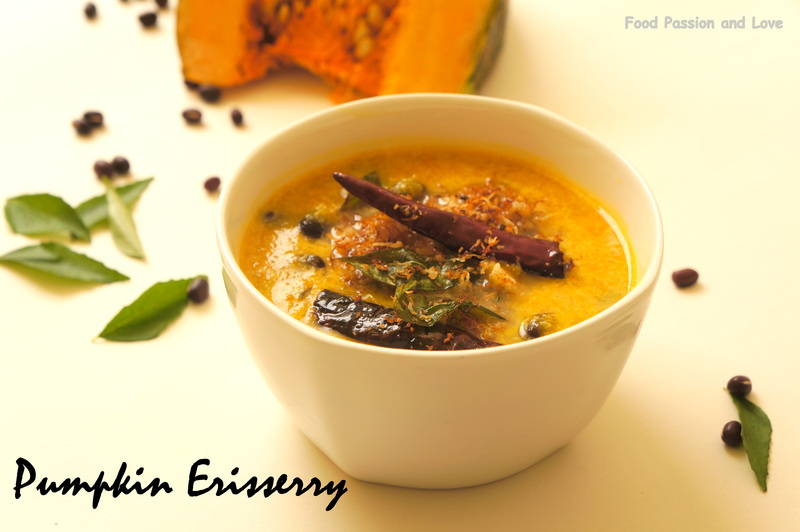 Pumpkin Erissery is one of the many inevitable dishes in the Kerala Sadya!Erissery can be made using different vegetables ,together with red cow peas /Van payar,but the common favourite among most keralites is Pumpkin/Mathanga Erissery. Pumpkin/Mathanga – 3 cups(Skin cut off and cubed. Soak Cow peas/Vanpayar overnight.Next day cook it with some water and salt until soft.Keep aside. In a vessel,cook cubed pumpkin along with a little water,chillipowder and salt till pumpkin is cooked. Grind the ingredients under “To Grind” .Now add the cooked cowpeas to the vessel containing the pumpkin.Gently mix.Simmer on a low flame for 2 minutes.Now to this add the ground coconut mixture and again simmer on low flame for 1 minute.Add salt if needed.Turn off the flame and keep aside. Now heat coconut oil in a pan.Add mustard seeds and when they splutter,add Dry chiilies,Curry leaves and grated coconut and saute till coconut is browned. Turn off the flames and pour this into the Cowpeas-Pumpkin mixture.Mix gently.Transfer to serving dish.Serve hot with steamed white rice and Enjoy! This entry was posted in Uncategorized and tagged Kerala sadya, Mathanga erisser, Onam, Pumpkin erissery, Vanpayar, Vishu. As I had said earlier that I hate Brinjals/Baingan ..But Dahi Baingan I had prepared using Brinjals was totally impressive. Surprisingly..I liked it..Me and my kids unlike my husband love potatoes/Aloo…we love potatoes in anything…So today I just thought why not make Dahi Aloo! 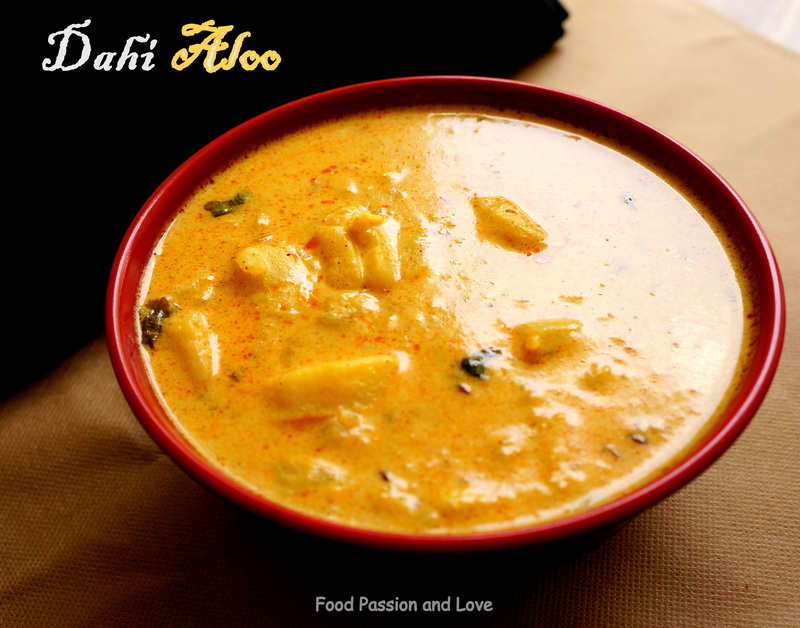 The combo of potatoes with Dahi(Yoghurt) is simply super! And this dish turned out to be “Super”….thats the word my elder sonny boy told me when I served Dahi Aloo with Rice and Spiced Vegetable Omelette for lunch today! So sharing this simple and humble yet utterly delicious recipe with you! Boil the potatoes. When cool, Skin and crumble with clean fingers. Heat oil in a pan and add the cumin seeds and fennel seeds. Then add grated ginger and sauté for a few seconds. Now add the asafoetida. Add the crumbled Potatoes to this. Saute. Then add Turmeric powder, Red chilli powder, Garam masala powder and combine well. To this add the yoghurt and stir. Add water and stir again. Add salt. Simmer for a few minutes until the gravy is thick. Garnish with cilantro/coriander leaves .Serve hot with Rice/ Roti. This entry was posted in Uncategorized and tagged Aloo, Dahi, Fasting recipe, Potatoes, Spiced yoghurt, vegetarian. Last year, we went for a Chinese New year party to my husband’s colleague’s place. There was this huge spread of Chinese dishes on many tables. Though I was not so very familiar with Chinese Cuisine, I couldn’t make out what all the dishes were. But one dish at the centre that caught my eye was Spagetti and Meat balls. And when I got to taste it, it was awesome…it was a Chinese version. It was simply delicious! Surprisingly my kids loved it too. From then on..I had been wanting to try Chinese Spagetti and Meatballs one day.Then last weekend, I made it…Came out real good. I don’t know if this is the authentic way of doing it.This is my version.It tastes really good. Water to cook the spaghetti. Soy sauce – 5 tbsp. Dry roasted Sesame seeds – 4tbsp. In a big vessel, cook spaghetti with a little salt and oil to al dente. When cooked , reserve 1/3rd cup of the water and drain the rest of the water away and keep the pasta aside. Place the minced beef in a bowl. Add egg to it. Now add the bread crumbs. Mix well with clean hands. To this add salt, Pepper powder, Five-spice powder, chopped onions and 2 tbsp of Soy sauce. Mix well and shape into small balls. In a pan/Kadai , heat oil. Deep fry the balls till golden brown and well cooked. Place on a kitchen towel to drain off the excess oil. Now heat 3 or 4 tbsp of vegetable oil(I used sunflower oil) in another big pan/wok. Add finely chopped garlic and sauté well. To this add the cubed onions and the white of the Spring onions and Saute for a minute Now add the julienned carrot and finely shredded cabbage and sauté for 4-5 minutes. Then add Black Pepper powder, Sweet chilli sauce, Soy Sauce and the chopped greens of the spring onions and sauté well. To this add the 1/3rd cup of water(water in which the pasta was cooked).Bring to a boil, add the cooked pasta and on high flame ,toss for 1 minute so that the Pasta absorbs and gets soaked in the sauce.Sprinkle the sesame oil and toss well. Garnish with dry roasted sesame seeds and meatballs and serve and Enjoy! If you don’t have Chinese Five Spice Powder, heres the recipe. Heat a pan and dry roast all the above ingredients on low fire(Taking care not to burn the spices). When it emits an aroma, turn off the flame. Allow to cool. Grind finely to a fine powder. Store in an air tight container. 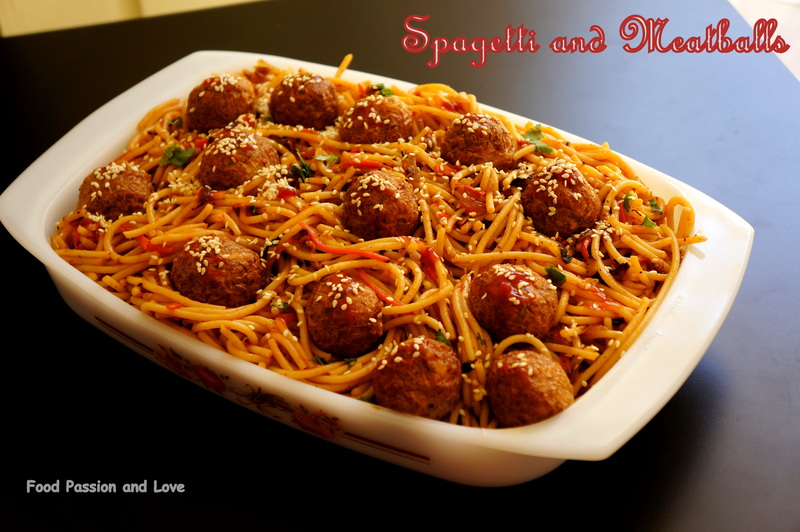 This entry was posted in Uncategorized and tagged Chinese Five Spice Powder, Five spice powder recipe, Meatballs, Sesame seeds, Spagetti and Meat balls, Spagetti and Meatballs Chinese Version, Spagetti recipes. Arya Bhavans are a very popular chain of restaurants of Tamil origin in Kerala…And due to its popularity,there are a lot of Arya Bhavan Restaurants in many different parts of Kerala.And when ever I travel with my folks to some faraway place to attend a marraige or any other family function,we make it a point to have breakfast only from Arya Bhavan…The food they serve there is absolutely delicious…We love the Ney Roast and Masala Dosas…and most of all the moutwatering Sambar…my very favourite.At home,I had tried many different Sambar recipes,but still had not achieved that particular “Arya Bhavan Sambar Taste”…So my quest for that particular Sambar recipe went on and on….Thats when I stumbled upon this particular recipe and with my own changes,I made it…Its a keeper really! !I have made Sambar like almost 5 times after I got this recipe…And each time…its sooo tasty…exactly the Restaurant Style Sambar…So I decided to share this recipe today…for those who crave for the Restaurant Style Tiffin Sambar…Trust me guys…!You will really love it! Rinse lentils well and then add them to the pressure cooker with 2.5 to 3 cups water and ¼ tsp turmeric powder. pressure cook the lentils for 8 to 8 whistles or more, till they are soft and well cooked. mash the lentils and keep aside. In a small frying pan, heat 2 tsp oil. first fry the mustard till they crackle. then add the coriander, fenugreek seeds, cumin seeds, black pepper, chana dal (bengal gram), curry leaves and dry red chilies. stir and saute till the spices become aromatic. keep aside to cool. don’t burn the spices. saute the spices on a low flame. once the spices cool, grind them to a powder in a dry grinder or coffee grinder. keep aside. Soak the tamarind in warm water for 25 to 30 mins. Later squeeze the tamarind pulp. strain and keep aside. Chop all the vegetables. quarter the onions. peel and dice the carrots and potatoes. Dice the brinjals and add them in water to prevent discoloration. chop the tomatoes in small pieces. In a pot, heat oil first. add the mustard and urad dal. let the mustard crackle and the urad dal turn into a slight brown color. Add quartered onions or shallots, curry leaves and asafoetida. stir and and saute for 2 minutes. Then add the veggies and saute for 4 to 5 minutes. Add the tomatoes, salt and continue to saute for 6 to 7 minutes more. Pour water. then add the strained tamarind pulp and stir well. Simmer until the raw aroma of the tamarind goes away. about 8 to 9 minutes. If the vegetables are not cooked, then continue to simmer till they get cooked. Now add the ground sambar masala which we have already prepared. stir. Add the mashed lentils. stir and simmer sambar for about 6 to 7 minutes. add hot water if required depending on the consistency you want. The sambar which is served in the hotels is on the thinner side. 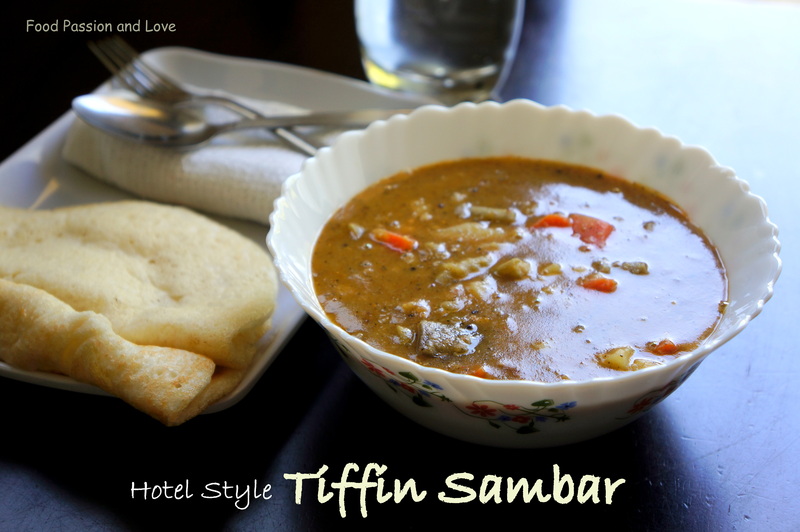 Garnish with coriander leaves and serve the tiffin sambar hot with idli,Dosas and Enjoy!! you can add your choice of vegetables. This entry was posted in Uncategorized and tagged Dosa, Easy Sambar, Hotel sambar, Restaurant style Sambar, Sambar, Tiffin Sambar, vegetarian.